In other words: how Alexa will eventually use my Nest data to sell me a cashmere sweater – and not just any cashmere sweater but one that I really really like. Great article about our relationship with the NET. Negotiations at the IRL/URL Border | Motherboard. I say it every year and I’ll say it again this year. A little proud to see Los Angeles’ Image as one of the trends. Intrapreneurs …. the bravest of them all. I have been an intrapreneur for practically my whole career. Even before it was called Intrapreneur. It’s really hard sometimes. You find yourself being that innovative and fearless voice in the corner of a large organization (whether you work for the co, or for the consulting co or agency they’ve brought in to play the role). And when you are that person – alot of people just plain out hate you. Your mere existence gives threat to an established world order. Most people don’t like change. They fight it tooth and nail. I never understand it. Discovering new things, trying new ways – it’s so exciting! It’s like the world is a giant puzzle but so many people just can’t do it. I absolutely loved this article. Especially the part about integrity. So much of corporate life can be filled with a lot of smokescreens. Watching that succeed has always been so frustrating for me…because I do really believe that authentic integrity is hard to come by these days. And I’m proud I have it. Thanks David K Williams for highlighting the importance. There’s been much discussion of late about the entrepreneurs within an organization—those highly valuable executives and team members who will perhaps never become a company founder, but who have learned to apply the essential principles of entrepreneurship to the roles they fill within a company. We refer to these employees as “intrapreneurs” because they’re not entering into their own, work venture, but they are working within your company, thus the “intra” part. Our company, Fishbowl is filled with intrapreneurs. They think and behave like owners. Most of them actually are as our organization is employee owned. They are invaluable to the company’s health. But how do organizations recognize and develop intrapreneurs, and, even more importantly, how can you be sure they won’t leave? 1. Money is not their measurement. Intrapreneurs certainly respect the value and importance of money. They understand the economic drivers that allow the organization to succeed and are able to support this fundamental truth and not fight it. A non-intrapreneur is perpetually looking for non-economic ways to justify their own advancement and payment. An intrapreneur “gets it” and does their work in a way that shows the organization they are someone it can’t afford to lose. The money and advancement finds them. 2. They are “greenhousers.” When you speak about an intriguing idea to an intrapreneur, the idea never leaves them. It germinates within their mind, and they carry with them the desire to figure out how to make it work. When you see them next, they are likely to have grown the seed of an idea into a full-blown plan or they will have created an even better set of alternative plans in its stead. 3. They know how to pivot. Intrapreneurs aren’t afraid to change course, nor do they fear failure. It isn’t outward bravado that drives them but an inner confidence and courage that every step takes them closer to their ultimate goal. In my own training and vernacular I call this phenomenon “failing up.” I celebrate opportunities for growth, even painful ones. 4. They behave authentically and with integrity. Most importantly, intrapreneurs exhibit the traits of confidence and humility—not the maverick behavior of corporate hotshots, Govendarajan and Desai say. I agree fully with this conclusion. Integrity (along with Respect, Belief, and Courage) are key among the traits I call the 7 Non-Negotiables, which have driven my own company to miraculous accomplishments and are at the core of the methodology I describe in my book. A budding businessperson could carry every other characteristic in spades, but without a foundation of integrity, they will fail (and the work landscape is littered with many examples of such failures). So if these are the traits that describe what an intrapreneur looks like, where will you find these individuals and how can you ensure they will stay? For starters, a company founded with an entrepreneurial/intrapreneurial emphasis becomes a magnet for more of the same. Employees recommend the company to others who share their values. Like breeds like, which is also to say that a company can’t conduct itself without integrity and still expect to find those traits upheld in its ranks. With time and experience, you will learn to ask the searching questions that will help you determine the true traits of the individuals you consider. The search will be worth the effort, as tomorrow’s world of work ecosystems will be driven by the increasing ranks of intrapreneurs. I flew your airline this past Friday from NYC to LAX. It was the worst travel experience I have had in years. Now I know that may sound harsh. But truly. The worst. From the woman on the phone booking the wrong day to the broken bathrooms on the plane and the ONE WORKING BODY SCANNER for an entire terminal of domestic and international travelers. Wow Delta. Third world airlines are more up to snuff than you are. But as always – absence makes the heart grow fonder. In the past 8 years I have really become a United girl. At one point I was even 1K for 3 straight years. United? Their planes from LAX to JFK? awesome. they have this class of service called P.S. – they realize that the people on that route are probably not just your average vacationers. They aren’t filling those planes with people on their way back or to the further reaches of the world. It is the most civilized route in the industry. The big spacious business class, the better food, the personal dvd players. It almost rivals what we see on the new sshow “Pan Am”! (Ok not quite but — I’m just saying – way better than your tattered and torn planes that barely look like they have been cleaned once this month let alone between flights). And your staff. Maybe watching Pan Am is spoiling it for me…but your staff – well. It would be nice if after paying an exhorbitant amount for an airline ticket the flight attendant didn’t act like she was working behind the counter at Burger King. I don’t know…just sayin. Wisecracking with the extra sparkly eyeshadow and the attitude that she is being bothered by those of us in need of water? Not really pleasant. I wish I still had my uber important status on United. I do….I can only imagine that the Delta Club is like entering a grimy seedy bar where the United club is like a fine spirits house. Delta = Dewars and United = 30 year Peat limited edition. But mostly I just felt like i was in another country, on another planet – you don’t really think about what the small things are that an airline does to instill loyalty other than giving you the free tickets for less miles. Everyone should take some hints from United’s P.S. service. Hell – I’d trust them to start setting me up on “blind seat dates” in P.S. service. If he’s flying United P.S. I already know he has standards! So Delta. Get it together. You are one of the last ones standing and the people at Air France must be horrified that they are aligned with you and your lack of…..style. service. substance. I hope United and Air France join up and they open P.S. service to Paris. Now that would be some good airline food. how about water instead of pepsi? i love this idea. and when i think how it could do good in the world “i’d like to buy the world a dasani and keep it company” oops. wrong drink – wrong brand….but you get the point. seriously. i have been working alot lately on the idea of “social media for social change”. this is a far cry from using social media to sell hip hop records and rock and roll but it is so unbelievably fulfilling – and i see this and think wow – Jaimie Oliver needs to drop one off at every school filled with WATER. did you know that many schools do not have DRINKING WATER? it’s true. And then let’s take it larger to underserved nations. Imagine if you could randomly donate a bottle of water to an inner city school kid who only has a choice of soda or sugared fruit punch at school? Imagine if you could drop this machine in the middle of an area recently struck by natural disaster and allow people to donate bottles of water to survivors. The concept right now is harnessed around pepsi – but truly it could be anything inside that vending machine – food, water, medical supplies – really anything. How awesome is that? It was not long ago that we wrote about frinXX, the German service that enabled users to buy drinks for friends remotely via Facebook. Now, in a similar vein, Pepsi’s new “Social Vending System”, lets users buy PepsiCo drinks for their friends through a digital vending machine. Users of the touch screen vending machine can choose to buy a drink for themselves, subscribe to the Pepsi Refresh Project, send a drink to a stranger, or to gift and redeem a drink from a friend. In order to send a gift, users choose a drink, enter the recipient’s name and mobile phone number, and type a personalized text message to be sent along with a unique code to the recipient’s phone. There is also the option to then record a video message using a camera built in to the vending machine. Once the text message has been received by the gift recipient, the code can be entered at a Pepsi social vending machine to redeem the gifted drink, and the pre-recorded video message will be played back on the touch screen. JWT’s “Things To Watch” is ALWAYS a great way to start the new year with your mind ticking away at new ideas, innovative ways of looking at our daily life and yes, even after all that holiday shopping, build a shopping list. go get a beer, grap your ipad and indulge in prediction! This article is on the money. Over the years working with brands and artists and copyright owners there is always the discussion of who is going to work with who and for what audience. Many times this is thought out, but often people are just concerned with “getting what everyone else has” – keeping up with the Joneses. If there is a hot band or artists, everyone wants to work with them because they still see the BIG numbers more often than the big picture. No matter what your business is around content; advertising, retail, B2C, B2B, distribution and funding – having a content CURATION strategy is the most important thing you can do today. People consume what is put in front of them more often if it is the RIGHT thing put in front of them. In a global economy where you can buy the same jeans, music, sodas, movies, books – anything – in almost any part of the world – CURATION – choice is important. And knowing your consumer is the first step. Who are you talking to with your content choices? What are they looking for? 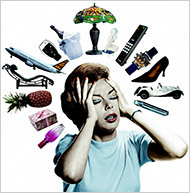 Presenting everything overwhelms the senses and ultimately unless you are Wal-Mart or Target – difficult to succeed. And even these two gigantic brands choose what content they will be promoting or associating with carefully. We often also let our own personal preferences get in the way of our consumer – one of my favorite mantras is: “Repeat after me – I am not the demo”….it is important to know this when choosing what content to curate – keeping an unbiased data driven (and gut driven) approach to your consumers/viewers/users is key. This isn’t something everyone can do on their own; and certainly those of us having worked in content development and marketing for years know that it is a careful mix of selection, promotion and positioning that gets the consumer to relate to the content you have to offer – or at least some of it. Ok, I hear all the content-makers sharpening their knives to take me on. Content used to be the high quality media that came out of the very pointed end of the funnel. Articles in the New York Times. Movies from Miramax. Thursday night comedy from NBC. Books published by Simon and Schuster. Creative folks wrote pitches, treatments, sample chapters, pilots, but only the best of the best got published. Then, the web came along and blew that up. Kaboom! Now content has gone from being scarce to being ubiquitous. Bloggers make content. Flickr photographers make content. Facebook posts are content. Tumblr publishers make content. Content isn’t King because it isn’t scarce. It’s everywhere, it’s overwhelming, and it’s gone from quality to noise. Which isn’t to say that this is a bad thing — it’s actually very very good. It’s freedom. It’s public discourse. It’s new communities that were previously silenced by their inability to access broadcast distribution outlets now getting to have their chance in the spotlight. As someone said to me a few weeks back: “Andy Warhol was wrong. We’re not going to be famous for 15 minutes. We’re each going to be famous for 15 People.” Indeed. Devices: Everything makes media now. Cell phones, laptops, digital cameras, iPads, web cams, as well as location aware software like Foursquare, Gowalla, Yelp and a zillion others. The combination of where we are, what we like, what we’re doing and what we’re saying all creates micro-media. 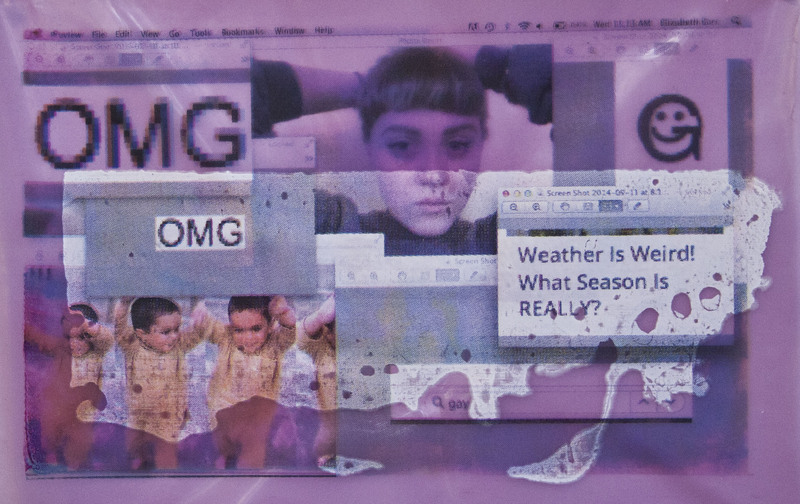 Content is being exuded out of our digital pores. Bandwidth: 3G is here, 4G is around the corner. Wifi is slowly but surely being pushed out and shared, though it’s currently strangled by passwords and firewalls. But just watching the ‘check in’ phenomena of Foursquare is a clue about how quickly content creation is becoming an everyday part of what we do. Sociology: People like sharing. They like sharing bite size info about what they’re doing, where they are, who they’re with, what they’re buying. They massive influx of consumer created crowd content shifts content from scarcity to abundance, and then to an overwhelming fire-hose of undifferentiated data. So, what institutions does this ‘Content Tsunami’ put under pressure? Publishing: In a world where everyone makes content, publishing is no longer able to lay claim to being the ‘best’ maker of quality content in their field. In fact, content creation is costly and painful though this may be, may not result in measurably better content than content curation. Mixing creation and curation is essential for survival. Check out Huffington Post for a mix of created, curated, and crowd-sourced content. Experts: It used to be that there were a handful of folks who where thought of as experts in their field. So the folks who owned the publishing platforms got to determine who was an ‘expert’ and build their brand. Now, that’s upside-down. Social media superstars are able to create visibility though leadership and personal brand value with ubiquity of voice. The new Expert is the leader with the most twitter followers, not the person on the speed-dial from CNN. Advertising: We’re standing at the end of an era. “Mass Media”, the ability to reach large segments of the population with a single message is essentially over. For advertisers, the need to find content in context, and to have that context be appropriate for their message and their brand is critical. So, Curation replaces Creation as the coin of the realm for advertiser-safe environments. No longer can advertisers simply default to big destination sites. The audience is too diffuse and the need to filter and organize quality crowd-created content is too critical. Search: Search was a critical solution to bringing audience to the web. But today the vectors that you can “search” on don’t reflect what audiences need to know to find what matters to them. Search provides the name, date, and other algorithmically chosen variables. But what makes an article right for Huffington Post, but wrong for News Max? The voice of the content and the context, which require human curation and crowd collaboration. We’ve arrived in a world where everyone is a content creator. And quality content is determined by context. Finding, Sorting, Endorsing, Sharing – it’s the beginning of a new chapter. And not since Gutenberg have we seen such a significant change in who’s able to use the tools of content creation to engage in a public dialog. 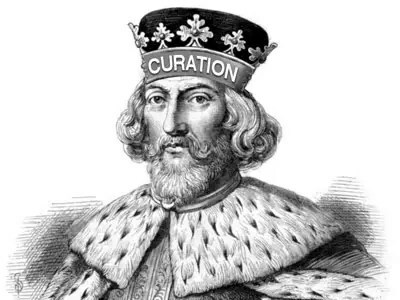 The emergence of a new King — a Curation King, reflects the rise of the new Aggregation Economy. It is an exciting time to be in content, and the best is yet to come. Currency: selling names and data to advertisers. Always has been always will. I still have not joined the foursquare revolution – as me. I’ve checked it out but I’m not ready to broadcast my whereabouts to my network. What if I WANT to sneak off at 4pm for a manicure in between meetings? Does the world really need to know how many cups of coffee a day I consume from my local caffeine dealer? Still – foursquare is fascinating. And as usual – an advertiser driven revenue model is at the end of the chain. But who’s spending advertising money? We need a new term to describe “direct to consumer social media marketing advertising that you pay for.” and then convince people to pay for it….i mean we haven’t even converted people to paying for pre-roll or post-roll yet and HOW many hours of viewing time does online video content get? NEW YORK (AdAge.com) — Don’t look now, but big brands are checking in on Foursquare. Pepsi, frozen-dessert chain Tasti D-Lite and cable network Bravo are all attempting to harness the power of the mobile game/social network. The question is whether they’ll pay for the privilege. Or whether Foursquare, which has 300,000 users now voluntarily “checking in” at locations, and broadcasting that to their followers, will transcend its current “it” status among the technorati and become a lasting consumer phenomenon — and a marketing tool. In December, Pepsi made a small bet on the startup as part of its Refresh Everything community-giving push. For every point earned in New York, Pepsi donated 4 cents to inner-city youth center Camp Interactive. After one week, New Yorkers on Foursquare earned 225,000 points, and nearly $10,000 for the organization. It was a small deal with a big brand that generated little if any revenue for Foursquare. Still, it got Pepsi excited about the possibilities. That’s exciting, also, for Foursquare, which in this deal and others is starting to build the foundation of a revenue model on location-based marketing services. Foursquare is planning paid services for three tiers of businesses: small, privately owned stores and restaurants; brands with retail chains, such as Tasti D-Lite; and huge multinational marketers such as Pepsi. For bigger brands, Foursquare is developing an analytics dashboard so businesses can track who’s coming into their stores. Then, deals could be sold against impressions such as web ads, clicks such as search ads, or a completely new model: cost per check-in. But before it can do any of that, Foursquare must prove it can expand beyond early adopters and educate marketers on how to use the service in ways its fickle users won’t hate. The company also launched a loyalty program that’s synched with Foursquare and Twitter, so customers earn points for making purchases and for checking in. When visits are published to customers’ Twitter stream, Tasti D-Lite gets in front of all their friends, and a customer earns extra points toward free dessert. Right now, Specials Nearby — there are nearly 700 since Foursquare launched the feature in summer — are free to businesses. So is the API off which Mr. Emerson built the loyalty program. Likewise, Foursquare’s Bravo deal gives the company TV exposure, if not revenue. It’s a difficult balance: Foursquare’s ability to continue to grow depends on its users accepting at least a bit of marketing along with the badges, or honorifics, they earn, such as “mayor” (for most visits), “newbie,” “bender” (for consecutive nights out) and, yes, even “douchebag” (for checking in at places like Barneys). Zero to 300,000 isn’t bad for an app that launched less than a year ago. It took more than three years for Twitter to reach its current fever pitch. But even as it grows, Foursquare will have to answer the same questions. Research firm Sysomos estimates that 5% of Twitter users generate 75% of activity. i know I have too many shoes. so it may be hypocritical to post this…but i think that ONE weakness is okay…. I’ve read alot on this subject and was happy to see the NYTIMES cover it around the current economy. There is so much research available on what countries are happiest based on their average income, what dirves happiness, but i thought this article really nailed it in terms of what really makes you happy. There is always that amazing sale that we all wished we had taken FULL advantage of; but in reality it’s when we choose to go shopping instead of to that party, or dinner, or vacation that we regret not participating in LIFE. As a marketer and a consumer I read these with trepidation; does it attack my profession? My needs and desires? Or is it okay? I’ve always been a small space proponent; I haven’t lived in more than 1k square feet since I left my mother’s house at 18; the mcmansion need was never a part of my psyche (just the shoes). And I am a large proponent of travel and experience. I spend more money on food and travel than I do on gadgets – in fact I still have a 13″ Panasonic flatscreen, that I purchased in 1998, as my bedroom TV. I also think it’s interesting that they went all they way down to the college age demo for some of this research…considering the stereotypical “broke college student”. We interrupt this recession to bring you news of another crisis that is much more pleasant to deal with. Now that shoppers have sworn offcredit cards, we’re risking an epidemic of a hitherto neglected affliction: saver’s remorse. Looking back, do you regret spending too much, or do you wish you had bought what you wanted? Join the discussion. The victims won’t evoke much sympathy — don’t expect any telethons — but their condition is real enough to merit a new label. Consumerpsychologists call it hyperopia, the medical term for farsightedness and the opposite of myopia, nearsightedness, because it’s the result of people looking too far ahead. They’re so obsessed with preparing for the future that they can’t enjoy the present, and they end up looking back sadly on all their lost opportunities for fun. He and Dr. Keinan managed to change consumers’ behavior simply by asking a few questions to bus riders going to outlet stores and to other shoppers shortly beforeBlack Friday. During the current recession, hyperopic Ants are presumably having a harder time than ever parting with their own cash, no matter how often President Obama and his economists urge them to do some stimulative shopping. But would these Ants — and the economy — be better off if they relaxed a little? (You can provide an answer at TierneyLab,nytimes.com/tierneylab. ) I asked Dr. Kivetz for his advice to shoppers.